Sick of traditional restaurants or even roaming food trucks? New Yorkers can now indulge in high-end cuisine from all corners of the world inside NYC’s newest food destinations: food halls. Eat to your heart’s content and learn how to make various famous regional dishes all in one place. Several restaurants, food stands and marketplaces combine to make these venues the perfect destination for authentic meals and recipe ideas, and being able to rub shoulders with world-renowned chefs and culinary experts is an added bonus that transforms these food halls into an unparalleled culinary experience. 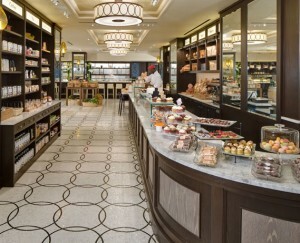 On June 4, The Plaza Hotel introduced its newest culinary endeavor, The Plaza Food Hall. Conceived by Todd English, who heads his own show on PBS Food Trip with Todd English, this food hall features a European-style market offering an extensive array of dishes to appeal to everyone from New York locals to visiting vacationers. Executive Chef Mike Suppa is the mastermind behind this panache of taste offerings. Seafood can be found at “The Ocean Grill & Oyster Bar,” Asian-American at the “Dumpling Bar” (in addition to the sushi bar), while “The Grill” offers burgers, salads, and more. If that isn’t enough, there’s a bakery, a cheese and charcuterie counter, a wine bar with tapas, and a stone hearth oven for pizza. Guests enjoy all this in the spacious 80-seat space, complete with a mosaic floor. Moderate prices of $10-$30 make the experience easy to digest. English even makes sure his customers can bring home a little Food Hall with them: market items to buy include coffee, tea, jams, spices and sauces. Or if home is too far, you can buy a Food Hall picnic basket and enjoy it in Central Park, leaving no crumb behind. 768 Fifth Ave. (at Central Park South) New York, NY 10019. Hours: 7:00am to 9:00pm Sunday- Thursday, 7:00am to 10:00pm Friday and Saturday More info can be found at http://www.theplazafoodhall.com/ or by calling (212) 986-9260. 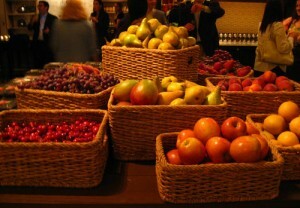 NYC’s newest hot spot for Italian gourmands, Eataly, opened August 31 in the Flatiron District. Offering culinary classes and the finest foods and drinks from throughout Italy all under one enormous roof, Eataly hits all the right spots and raises the bar for food halls. 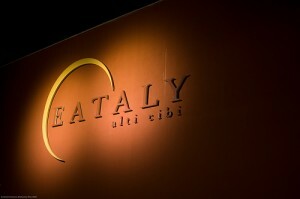 Owned by Mario Batali, Eataly adheres to a philosophy of creating a bona fide Italian experience for each guest, whether you consume the food presented by the resident chefs or buy the ingredients to create a feast yourself. The 42,500 square-foot space embodies every aspect of authentic Italian cuisine, from its Pizzeria Rossopomodoro—run by two men from Naples—down to the ovens used to prepare the foods (the Hall’s two wood-fired pizza ovens were imported from Italy). Other foodie-pleasing features include Lidia Bastianich’s on-site cooking school, “La Scuola,” a Lavazza coffee shop that opens at 7am for early birds, a gelateria and a paninoteca. Michael Toscano’s swanky Italian steakhouse, Il Manzo, is the only one of Eataly’s seven restaurants to accept reservations. Those looking for a lighter meal can peruse the savory delights at Eataly’s food stands, which include the Pasticceria, headed by Luca Montersino, the Rosticceria, which offers roast meats, and Il Laboratorio de La Mozzarella. A fresh pasta counter offers more than 20 varieties, and guests can stock up on various dried foods and jarred specialties in the marketplace. Eataly’s microbrewery will open in November and will feature monthly guest Italian brewers who will brew seasonal beers from various regions around the world. In the meantime, guests can enjoy drinks in Eataly’s 6,000 square-foot partially enclosed rooftop beer garden on the 15th floor, which seats 300 people. Located in the Toy Building at 200 Fifth Avenue, between 23rd and 24th Streets. Phone number and website are not currently available. This entry was posted on Monday, September 13th, 2010 at 12:13 am	and is filed under Stuff to Do. You can follow any responses to this entry through the RSS 2.0 feed. You can leave a response, or trackback from your own site.